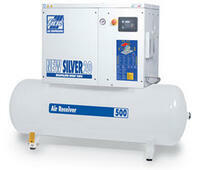 FIAC Silver rotary screw air compressors are available with 2 ASME/CRN rated air tank options and range from 3 - 30Hp. These air compressors, which are easy to service, adopt an advanced encapsulated air end that minimizes connection points and allows for optimal use of cabinet space. Designed for performance and reliability, this model comes equipped with a TEFC high efficiency electric motor, WYE Delta Starter, Sound attenuating enclosure, FIAC easy control microprocessor panel, After cooler, Thermostatically controlled axial cooling fan and two stage vibration isolation to further reduce noise levels.